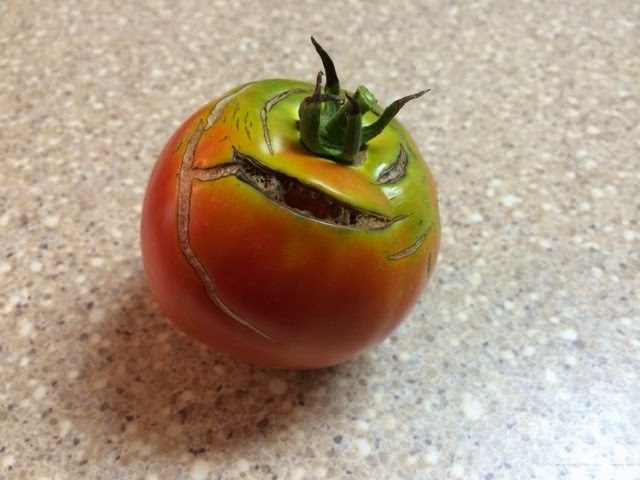 Are your tomatoes cracking up on you? It's all this rain we've been having recently. The abundant moisture causes them to grow too fast. The tomatoes are like the Hulk, bursting at the seams because of a sudden growth spurt. We have a competition going on to see whose tomato plant can grow the best tomatoes. So far Big Boy (my son) is beating out Amelia (my daughter) and German Queen (me) when it comes to sheer mass production. I'm still waiting on mine to turn, but I think they'll be tastiest.